At ActiveFilings.com we know that a lot of our clients are in search of funding for their great projects. That’s why we asked EquityNet permission to reprint the following article about Fundraising campaigns from crowdfunding sources. The article is designed as a Checklist and it goes through most of an startup process (If you have incorporated your business or formed your LLC through us, you will find that you have several checks of the list). Enjoy it! 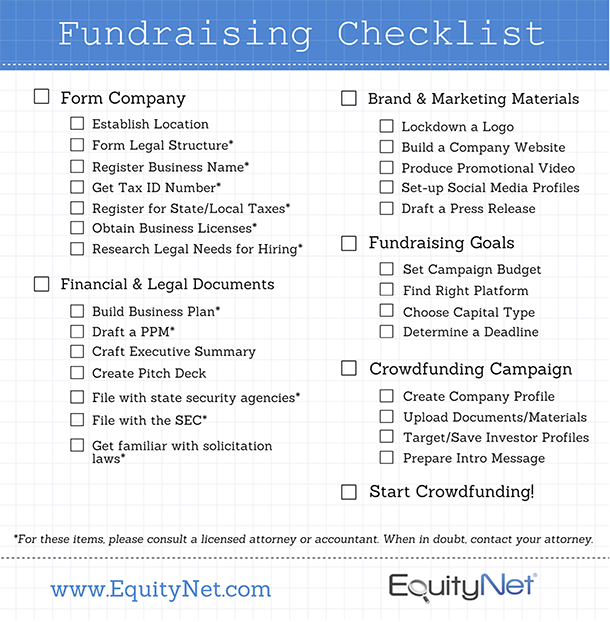 EquityNet is a recognized pioneer of crowdfunding and has operated one of the largest business crowdfunding platforms since 2005. The multi-patented EquityNet platform includes over 100,000 individual entrepreneurs and investors, incubators, government support entities, and other members of the entrepreneurial community. EquityNet provides access to thousands of investors and has helped entrepreneurs across North America raise hundreds of millions in equity, debt, and royalty-based capital.